So you’ve finally decided to homeschool…but have no clue where to get started? Just the mere thought of homeschooling can be a very daunting task. Delving into the unknown can also create an element of self-doubt that fills your mind right off the bat. That coupled with an overwhelming task of choosing and gathering curriculum, creating lesson plans, organizing supplies, and teaching multiple grade levels can be quite disheartening. As we all prepare for our upcoming school year, I thought it would be timely to walk you through some of the steps to getting started, choosing and gathering curriculum, creating effective lesson plans, scheduling your day, organizing your home, staying the course, and more! Whew! Sounds like a lot right? 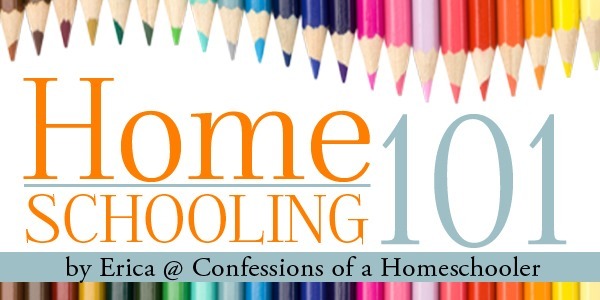 I’m here to help by covering all of the things necessary in detail in my Homeschooling 101 eBook, but I also wanted to share them in an abbreviated form on my blog as well to help out all of you new homeschoolers out there. As you may have heard already, there is no one right way to homeschool. 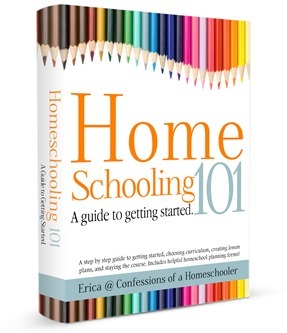 The Homeschooling 101 series of posts aren’t the end all be all of homeschool advice or a rigid set of rules that must be followed exactly. Instead I hope they are a tool that helps provide you with the means to get started in your journey. Take from it what makes sense for your family, and alter that which needs to be changed to fit the unique needs of your homeschool. The best way to begin your homeschooling journey is to start with the basics. First I suggest that you start off by creating a vision for your homeschooling journey. I think you will find you have all of the tools necessary to guide you through this journey if you seek God’s will for your homeschool, and take some time to pray for direction. By creating a vision statement for why you are homeschooling, you’ll have a backbone to fall upon when doubt and indecision creep in. In the Homeschooling Vision Worksheet you will define your homeschooling goals, what you are striving towards, and why you are choosing to homeschool. Once you’ve laid this foundation you will be more prepared for the trials that will follow. 2. Why are you homeschooling? Is this something you feel called to do, and are there other reasons motivating you towards this journey? Taking some time to list the reasons for your choice to homeschool is a great way to solidify your decision. Would my children do better if they were in a more traditional school? Am I teaching my children enough? Are they missing something by being taught at home? Unfortunately one of the biggest issues homeschoolers can face is the indecision and doubt factor. Of course we all want what is best for our children’s education, and if things aren’t going as expected we need a reminder of why we chose this path to start with. Knowing what the goals for our homeschool are, we can adjust what we’re doing so we’re moving toward those goals and not toward what someone else tells us we should be doing. I highly encourage you to write down your reasons for choosing to homeschool and keep it somewhere handy so you can refer back to it whenever you find yourself doubting your decision. For those of you who are interested, you can read our reasons for homeschooling here. 3. Know your state laws. While you don’t have to be a lawyer to homeschool, you will at the very least need a basic knowledge of your state laws and requirements for homeschooling. Each state is different, so you’ll want to make sure that you are following your specific state requirements. The best place to learn about your state’s homeschooling laws is by visiting the Homeschool Legal Defense Association (www.hslda.org). They have current homeschooling information, laws, and general information on getting started as well. At what age is a student required to start formal school? What is the amount of hours required per year? What kind of records do I have to keep each year? Is there a certain curriculum required? What requirements or qualifications must I have to teach my children at home? Is a Notice of Intent to homeschool required? If so when and where do you need to submit it? Is Standardized Testing required? If so, when and where do you send results? Are you required to “withdraw” from public school? If your students are currently enrolled in a school district you may be required to officially withdraw them from the school, then submit your notice of intent to homeschool prior to starting. As you can see there are some basic things you will need to find out prior to beginning your homeschooling journey, so please take some time to learn about your specific state requirements before we move on to Day 2 of Homeschooling 101. Stay tuned for the next post in my series on Homeschooling 101! Our Homeschool: Here is a list of posts on our curriculum choices, our schoolroom setup and our daily schedule. Disclaimer: I am not a legal attorney, nor do I have a degree in law. The information contained in this Book is what I have gleaned from my own research and should not be taken as legal advice. If you have any questions regarding homeschooling, please refer to the laws in accordance with your own state, or seek professional legal counsel. I am enjoying your book!! When I first got started, the laws were the most daunting aspect! Love your list – wish I had that list years ago. I just wanted to say thank you for all of the information you provide. The whole process is overwhelming but you make it easier. I am new to the homeschooling choice and will be homeschooling my K5 and Pre-K kids in the next 2-3 months. I absolutely love your information and candidness! I can’t get enough. Thank you very much! I feel much more prepared to homeschool, which I feel God has blessed me to do. Hi! I just bought the Letter of the Week program and am excited to get started! I have 3 boys, ages 2, 3 and 4. and am actually hoping to go through it with all 3 kiddos this year. Would you recommend just making one master copy and then printing extra work sheets as i go along? Thank you for sharing these task with us as we may Homeschool so I am looking for as much information as my little head can hold and the notebook I have started as well. Question… I have wanted to homeschool my daughter since she started school. Her dad put the brakes on and said absolutely not. She doesn’t like school and she and I hate common core. She is entering 6th grade and both she and I want homeschooling for her. Do you think it’s too late? Her dad is still against it. Well, you’ll have to work that out with her dad before you can move into homeschooling. It’s not too late to pull her out and homeschool her though. But like I said I would recommend making sure you and her father are in agreement before doing so. Hi, I need great advice. My son is very resistant to any teaching. He only wants to watch TV, mother goose club play house or his videos. How to introduce learning in a fun way?